Gabrielle Union has all your style needs covered just in time for the holidays. Gabrielle Union has her hands full with a brand new baby girl and she just unveiled her new collection with NY & CO. Her latest collection includes some amazing new pieces for affordable prices with most of the pieces coming in under $100. As with past collections, this one will also come in extended sizes with petite and tall ranging from XXS – XXL or 00 – 20 and some plus size pieces ranging from 1X – 3X. For this collection, Gabrielle Union enlisted the help of some famous friends to show off her new looks. 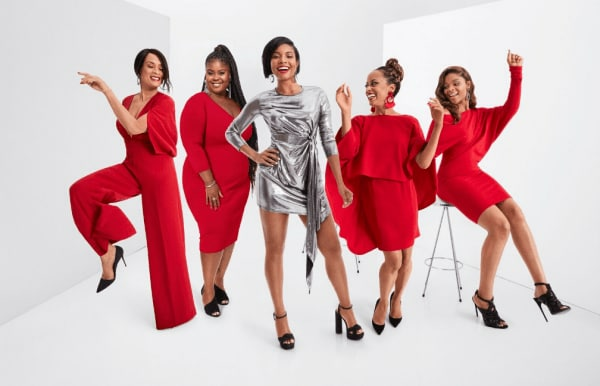 The campaign includes her Being Mary Jane costar, Raven Goodwin; her Breaking In costar, Ajiona Alexus; Marlon star, Essence Atkins and actress Valarie Pettiford,continuing her #AllTogetherNow message. There are tons of styles to drool over including a silver jacquard suit, statement reds, a long sleeve jumpsuit and some super cozy sweaters and pants. Expect to see the return of some fan favorites from last winter – a black sequin skirt, rainbow sequin skirt, sequin jumpsuit and sequin palazzo. We caught up with the actress to find out what inspired her to create this collection and find out a few of her style rules to live by. How did your lifestyle inform your design decisions? What was the ultimate goal? I wanted to design fashionable comfortable clothes that allow you to live your best life without the clothes breaking the budget or feeling like they are attacking you (and winning). I am so lucky that I was able to have some of my friends be a part of this campaign with me. It’s all about sisterhood. That’s why I’m continuing my #AllTogetherNow message. Every design is a piece that’s inspired by work , my life at home or from the traveling that I have done. I wanted to create a collection that was eclectic, versatile and most importantly, inclusive of everyone. What’s your favorite thing about this line? I love how festive and fun this holiday collection is. When we were creating the pieces, I kept envisioning what I love to wear during this time of year. The vibrant red is used throughout this collection as well as the use of metallic and sequins. Customers really loved my sequin pieces in the past so I listened and we are bringing you more in this holiday collection. I love a good statement jumpsuit and we have a few available. There are also some great cozy sweaters and pants. You can wear the pieces to holiday dinners or to ring in the New Year. There’s something for everyone. How does your wardrobe affect your outlook/ confidence? I really think that confidence comes from within and that clothes are a way for you to express that. I try to start each day with confidence and tell myself that I am worthy. My wardrobe choices vary depending on my mood and my style is ever-evolving. Sometimes I want to throw on a graphic tee and some boyfriend jeans with sneakers and other days I want to be all glammed up with a sheath dress and some heels. How do the pieces transition from work to play? What’s great about this collection and my past ones is that I’m creating pieces that you can mix-and-match. I want customers to have fun with it and I love when I see women that tag me in photos wearing the collection. It’s cool to see how they styled it and put their own spin on it. There is an amazing jacquard silver suit that you can wear to work and at night, take off the jacket and pair the pants with a black shirred blouse. Top 3 personal style rules? 1) Don’t be afraid of adding a pop of color to any look. This is especially true during the holidays. There is a statement red jumpsuit in this collection that I LOVE. 2) A tailor is your best friend. They can help make a look feel like it was made for your body. 3) Take some risks! Fashion is supposed to be fun so I always try to be open to some new styles that I haven’t tried yet.